Stuff the Bus will take place April 22nd thru April 26th. The PVP and PVM Classes that donate the most items on the list below will earn a Donut Party! PTA hopes to encourage our students to give back to the community that surround them. Every year, students gather as many food items as possible to fill the school bus parked in front of the flagpole for the week. 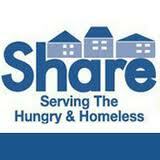 The items donated will benefit SHARE which serves the Hungry and Homeless locally.